↑ ᱟᱨᱚᱵᱤᱠ ᱯᱟᱨᱥᱤᱭᱟᱱ ᱧᱩᱛᱩᱢ ᱚᱱᱩᱵᱟᱫ;ᱫᱟᱨᱤ ᱯᱟᱹᱥᱤ ᱦᱚᱸᱧᱮᱞ ᱢᱮ. ↑ "FBI – USAMA BIN LADEN". ᱥᱮᱯᱴᱮᱢᱵᱚᱨ 25, 2012. Archived from the original on ᱥᱮᱯᱴᱮᱢᱵᱚᱨ 25, 2012. ↑ ᱥᱤᱣᱮᱨ, ᱢᱟᱭᱠᱮᱞ (ᱯᱷᱮᱵᱽᱨᱩᱣᱟᱨᱤ 7, 2008). "Yemen still close to al Qaeda's heart". ᱮᱥᱤᱭᱟ ᱴᱟᱭᱤᱢᱥ ᱳᱱᱞᱟᱭᱤᱱ. Retrieved ᱢᱮ 6, 2011. ↑ Strozier, Charles B.; Offer, Daniel; Abdyli, Oliger (ᱢᱮ 24, 2011). The Leader: Psychological Essays. Springer Science & Business Media. ISBN 978-1-4419-8387-9. ↑ Scheuer, Michael (ᱯᱷᱮᱵᱽᱨᱩᱣᱟᱨᱤ 17, 2011). 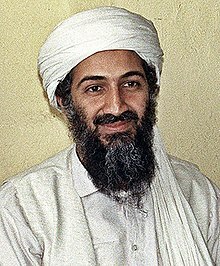 Osama Bin Laden. Oxford University Press, USA. ISBN 978-0-19-973866-3. ↑ Robert Fisk (2005). The Great War For Civilisation, p. 4. ↑ Robert Fisk (2005). The Great War For Civilisation, p. 22. ↑ "FBI Ten Most Wanted Fugitives". FBI.gov. Archived from the original on ᱡᱟᱱᱩᱣᱟᱨᱤ 3, 2008. Retrieved ᱢᱮ 26, 2010. ↑ Dan Eggen (ᱟᱜᱚᱥᱴ 28, 2006). "Bin Laden, Most Wanted For Embassy Bombings?". The Washington Post. Archived from the original on ᱡᱟᱱᱩᱣᱟᱨᱤ 15, 2010. Retrieved ᱢᱮ 26, 2010. ↑ "'Most wanted terrorists' list released". CNN. ᱚᱠᱴᱚᱵᱚᱨ 10, 2001. Retrieved ᱢᱟᱨᱪ 2, 2018. ↑ "Fbi – Usama Bin Laden". Fbi.gov. ᱟᱜᱚᱥᱴ 7, 1998. Archived from the original on ᱢᱮ 15, 2011. Retrieved ᱢᱮ 15, 2011. ↑ "The Navy SEAL Who Shot Bin Laden Is: Rob O'Neill From Butte Montana". Soldier of Fortune Magazine. ᱱᱚᱵᱷᱮᱢᱵᱚᱨ 6, 2014. Archived from the original on ᱰᱤᱥᱮᱢᱵᱚᱨ 3, 2014. Retrieved ᱡᱩᱞᱟᱭ 8, 2015. ↑ "World leaders React to News of Bin Laden's Death". CNN. ᱢᱮ 3, 2011. Retrieved ᱢᱮ 2, 2011. ↑ "Death of Osama bin Ladin". Pakistani Ministry of Foreign Affairs. ᱢᱮ 1, 2011. Archived from the original on ᱢᱮ 4, 2011. Retrieved ᱡᱟᱱᱩᱣᱟᱨᱤ 9, 2012. ↑ Baker, Peter; Cooper, Helene; Mazzetti, Mark (ᱢᱮ 1, 2011). "Bin Laden Dead, US Officials Say". The New York Times. Archived from the original on ᱢᱮ 5, 2011. ↑ Maqbool, Aleem (ᱢᱮ 1, 2011). "Osama Bin Laden, al Qaeda leader, dead – Barack Obama". BBC News. Archived from the original on ᱯᱷᱮᱵᱽᱨᱩᱣᱟᱨᱤ 4, 2015. Retrieved ᱡᱟᱱᱩᱣᱟᱨᱤ 12, 2015.